The Little Village community remains in a state of mourning following Sunday's tragic incident that resulted in the death of eight young lives after a fire broke out. Now, the focus is on two individuals fighting to stay alive. NBC 5's Lexi Sutter has the latest details. The children who died were a close knit group of siblings, cousins and family friends, the youngest just 3 months old. Two others from the group, both 14 years old, were on life support at Stroger Hospital. Fire officials said there were no working smoke detectors in the home. 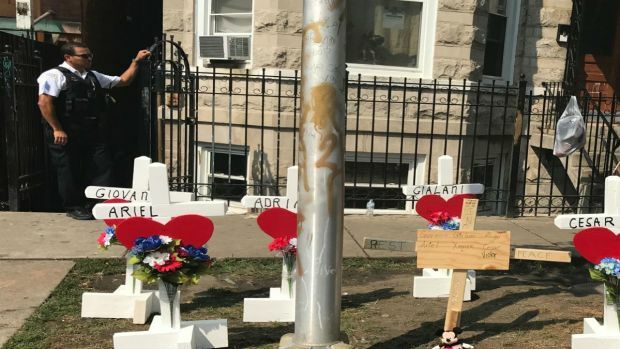 As family members mourn the deaths of six young children and two teenagers in a devastating West Side weekend house fire, a Chicago Fire Department official said Monday that "electrical problems" have been ruled out as the cause of the blaze. 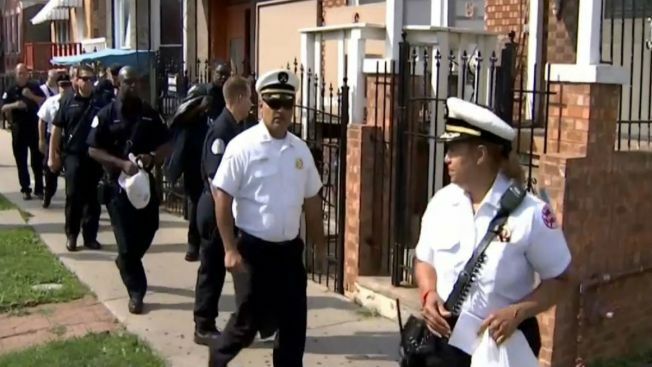 The fire, described as one of the worst fire tragedies Chicago has seen in a decade, began around 4 a.m. Sunday in an enclosed rear porch at the back of a building at 2224 S. Sacramento Ave., according to fire officials. While the exact cause remains under investigation, CFD spokesman Larry Langford told the Associated Press that investigators are exploring whether the blaze was caused by fireworks or smoking materials. The children who died were gathered together for a sleepover at the home when the flames sparked, family members said. They were a close-knit group of siblings, cousins and family friends, the youngest just 3 months old. Two others from the group, both 14 years old, were on life support at Stroger Hospital, according to family and fire officials. "I don't even got words to explain the pain I'm feeling right now," said Marcos Contreras, who lost four of his siblings in the fire at his mother's home. "It just feels like my whole world was crashing." Contreras said his mother had left the home with another sibling and returned to find her home engulfed in flames. "This is a tragedy beyond anything I ever dreamed of in life," said the grandmother of several of the children, Ramonita Reyes. Multiple agencies are now in the middle of a thorough investigation. Investigators said there weren't smoke detectors in the house. "We have not had this in many, many years, this amount of fatalities and injuries in one location," said Chicago Fire Department commissioner Jose A. Santiago. "This is very unusual." 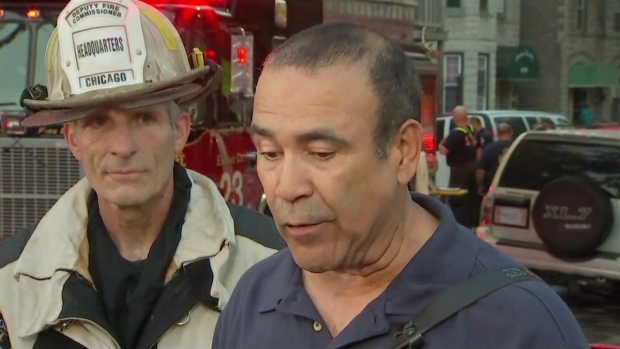 Chicago Fire Commissioner Jose Santiago speaks at a presser following a fire that killed eight people in Marshall Square, near the Little Village neighborhood. Santiago said the blaze was first reported when a woman called 911 saying she came home from work and smelled the fire. Police say the victims were immediately found on the second floor of the structure, which was described as a "coach house." By the time fire crews got inside the building, seven people were already dead, officials say. Santiago said a firefighter lieutenant was also injured in the fire and transported to Rush hospital where he remains in good, stable condition. "The city shares the grief of the families who have lost so many on this day," Mayor Rahm Emanuel said in a statement Sunday. "We now know the fire began in the rear and the exit to the front was clear, but without working smoke detectors the occupants were not awakened in time to get to safety. Our thoughts go out to not only the families of those who perished but to members of the department who pushed as hard as possible to reverse the deadly fate of the eight who are now gone. We all pray the two living victims will make a recovery despite the odds." Officials have not released the names or ages of the victims, except for 3-month-old Amaya Almaraz. Family members identifed the other victims as: Ariel Garcia, 5; Alanni Ayala, 3; Gialanni Ayala, 5; Xavier Contreras, 11; Nathan Contreras, 13; Giovanni Ayala 10; and Victor Mendoza, 16. A GoFundMe page was set up to help the families of the victims and the American Red Cross responded to the scene. Meanwhile, outside the home, a memorial of white crosses and candles is set out up to remember the children who lost their lives. "We just have to put our faith in God," Reyes said. "Hopefully he watches over the rest of our family, the ones we only have left," Contreras said. "Because you never know the last day you're going to see somebody."